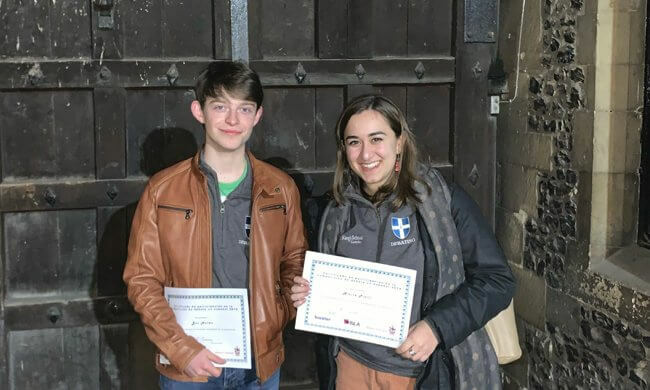 Congratulations go to Alexia Psalti (6a, BY) and Ben Helme (6b, GL) who were runner ups in the National Spanish Debating competition held at Alleyn’s School, London. They made it to the final of the competition in front of 13 other schools nationally! Their prize is a fantastic trip together to Salamanca in Spain. They spoke on the following three motions, getting past all three to the final. 1. Los movimientos feministas son imprescindibles en la sociedad española actual. 2. Debería tasarse el consumo de carne. 3. Las nuevas tecnologías son una amenaza para la democracia. As runners up they have one week in Salamanca where they can carry on improving their Spanish even further. Well done to both students.